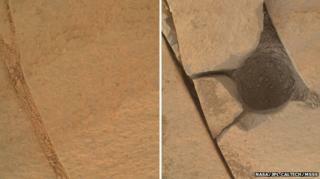 The Curiosity rover on Mars has smashed up the latest rock it has tried to drill. The robot's power tool split the stone slab into several pieces as it hammered down to make a test hole. Scientists working on the Nasa mission will now have to find a new target from which to pull up a sample for analysis. Curiosity is currently investigating the lower layers of Mount Sharp, the big mountain at the centre of the crater in which it landed in 2012. It is the usual practice to turn a test hole in a rock before pushing the drill bit the full 6cm into the target. The trial run ensures the slab will be stable and minimises the possibility of the power tool being damaged in any way. Curiosity recently hit the headlines for identifying methane and other, more complex carbon molecules in its exploration of Gale Crater. Methane on the Red Planet is intriguing because here on Earth, 95% of the gas comes from microbial organisms. Researchers have hung on to the hope that the molecule's signature at Mars might also indicate a life presence - although no such connection can yet be made at the Red Planet.